MAN CLAIMS HE BLOCKED BY RYDE FB AFTER ASKING FOR REFUND. BEWARE! You are at:Home»Caught In The Act»MAN CLAIMS HE BLOCKED BY RYDE FB AFTER ASKING FOR REFUND. BEWARE! Pls help! 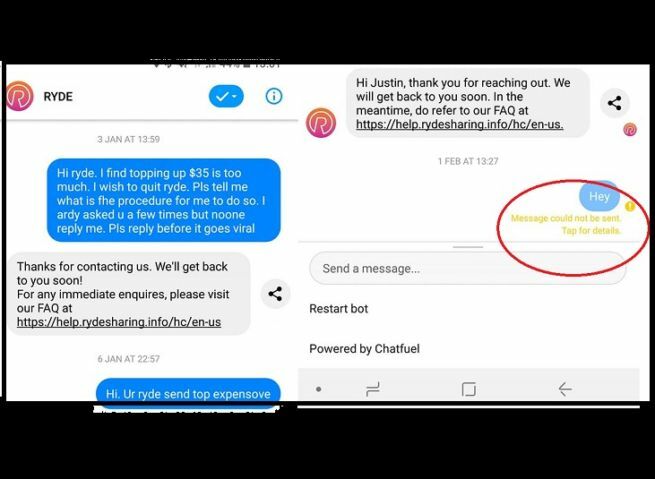 I have been calling, emailing and messenger Ryde to refund me the credits as i wont be using it any more. RYDE doesnt reply me and now block me from facebook messenger. The credit inside is going expire, and its unfair for us! Pls help! For those using ryde pls make sure u see the credit expiry date, Ryde will just take ur credit once its expired. Everyone pls send this viral and help! RYDE is treating its customer so unfair and trying to cheat our money like ofo! Previous ArticleGUY CLAIMS HE GOT NEW NOTES WITH SAME SERIAL NUMBER. BUT….